The combination lock is one opened not by a key but by the alignment of its interior parts in a definite position. The most common types have an internal mechanism consisting of a series of three or four interconnected rings or discs that are attached to and turned by a central shaft. Manually rotating the outside knob or dial turns the discs, each of which is "programmed" to stop at a notched opening or gate. However, with a four-disc lock, certain preliminary spinning of the dial is necessary to get the lock to move the correct disc. The knob must first be turned to the right and spun past the first number four times before being allowed to stop beneath the marker. Next, rotating in the opposite direction, the knob must pass the second number three times. Reversing directions again, the user must spin the dial past the third number twice, and so on. When the apertures of all the rings align, they enable projections on a spring-loaded bolt to slide through, releasing the bolt and opening the lock. Many people remember the simple padlocks that graced their school lockers. Picking these and other low-priced combination locks was frequently a game—and one often played successfully. With practice, an aspiring lockpicker could actually hear the audible clicks made when the protuberances on the bolt aligned with the notches on the discs. However, manufacturers of better locks design false gates in the discs to make cracking the lock extremely difficult. Only experts can distinguish between the three or more false gates and the true gate, and, since a lock with four discs can use any of 100,000,000 possible combinations, identifying the correct one by chance is unlikely. A typical combination lock of the padlock variety has twenty component parts, generally made of stainless steel or cold-rolled steel that is plated or coated to resist corrosion. Combination locks are constructed to last a lifetime, and their parts are not intended to require repair or replacement. In addition to steel, two other raw materials are essential to the combination lock. Nylon is used for the spacers that separate the discs, enabling them to turn independently, while zamak, a zinc alloy, is molded under pressure to form the bar, shaft, and outside dial. 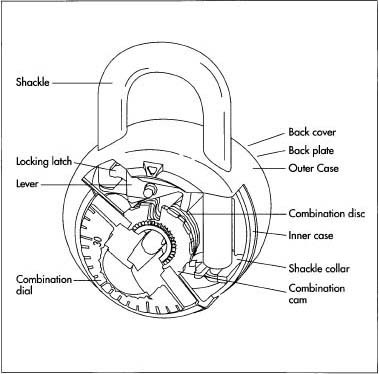 The various components in a combination lock are made in a variety of ways. 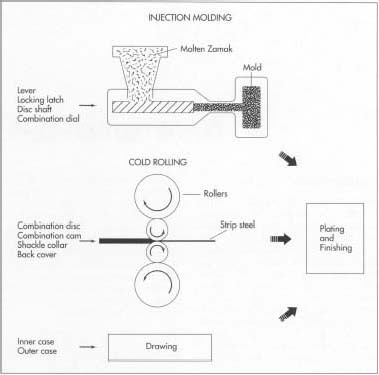 Some components, such as those made from zamak, are injection molded—the zamak is heated to a molten state and forced into a mold of the desired shape. Other components, such as the combination cam and disc, are cold rolled—passed between heavy rollers. Still other components are drawn or machined to the proper shape. Most of the components are then plated and finished to protect against corrosion. A combination lock's parts can be divided into two categories: internal and external components. Excepting the springs when extended, none of the internal parts exceed two inches (5.08 centimeters) in length. The internal works of the locking mechanism comprise the lever and supporting lever post and a disc shaft about which disc spacers and the combination disc turn. Two, three, or four combination discs are the key precision elements of the mechanism, but it is the combination cam, a notched disc, that generates the combination for the lock mechanism. The cam is also attached to the outside combination dial that is turned by the lock's user. The internal disc spring supports the combination discs under tension, enabling the combination to be dialed. Other internal components in the lock case include a shackle collar that holds the shackle (the U-shaped component that detaches from the case when the lock has been opened) in the locked position with a latch that fits into the shackle notch. An inner case encloses all internal parts and gives the lock body housing strength. External parts include the lock's outer case, the shackle, a back cover, and the combination dial. A fully constructed combination lock. It is the combination cam, a notched disc, that generates the combination for the lock mechanism. Combination locks are built to last a lifetime, and their ports are not intended to require repair or replacement. All About Locks and Locksmithing. Hawthorne Books, 1972. The Complete Book of Locks and Lock-smithing. Tab Books, 1991.
hey love the website i was wondering how a lock worked and bam! there it was in front of me. you people think of everthing thanks so much for the help. i have been wondering that question for ages thanks again. your website is so informative yet still easy to understand, and, above all, interesting.